A lieutenant and another soldier of the Royal Ulster Rifles observe a roadsign among the ruins of Caen in 1944. A soldier ‘keeps a sharp lookout for snipers’ in the ruins of Caen, 9 July 1944. Caen, two Scottish soldiers of the KOSB at the Rue des Chanoines, 1944. Caen, Rue des Chanoines, 1944. Two Scottish soldiers of the KOSB are watching a girl comes closer. German soldiers in Caen enjoying the view from the Caen Castle in July 1940. The angle is not perfect but I had no access to the exact spot. Soldiers in front of “The Pop Inn”, the new Navy Canteen, Army and Air Force Institute, Caen, France, July 27, 1944. 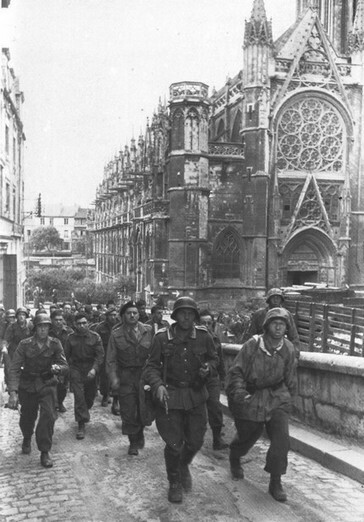 On the morning of June 6, Canadian prisoners of the Chaudière Regiment climbed the ramp of the castle (in the background the Saint Pierre church). Almost the same location. I had to replace them a little to the left because there is no ramp but a stairs today. Sherman tanks and 6-pdr anti-tank gun in the centre of Caen, 10 July 1944.